When in early 2013 she made her plans even more impressive, raising planned capacity to some 38,000-40,000 seats, some people started mocking the unrealistic plans. Even with two financing options presented, both not overloading the municipal budget – either a large EU subsidy for regional development initiatives, or a Chinese investor expressing interest in delivering the stadium and having it repaid by Craiova over a few decades. But mayor Olguţa Lia Vasilescu insists she will go on with her plan to give Craiova the second biggest and first most modern and iconic stadium of the entire country, a project she considers her life's largest and a lasting legacy. She made one step forward today as she presented the design, which raised quite a few eyebrows. Created by renowned Romanian practice Proiect Bucuresti (who, however, never had a challenge of this magnitude), the stadium had a unique bowl, inspired by famous scultpure of local artist Constantin Brâncuși “Mademoisselle Pogany”, created exactly 100 years ago. The massive arches dominating in proposed design resemble the eyebrow lines of Pogany. 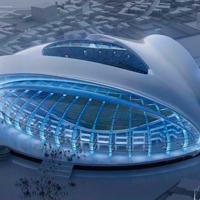 The remainder of the roof is to be a translucent or transparent dome with giant screens hanging over the pitch. Double-tiered stands should hold the announced 40,000-strong crowd with ease and a smaller athletic stadium for 5,000 people is planned next to the main one, along with significant public green area. The project still has some way to go with budget only roughly estimated at €100 million so far. Detailed documentation needs to be done, while the Ministry of Development will review Craiova's plans. If all goes well, mayor Vasilescu hopes to see groundbreaking in 2014 and opening after 36 months of construction.